Picture a tranquil place with soft light and a calming peace, now picture the Blue uGlobal in the corner...quietly cleaning the air you breath, using water & Lemon Grass essence releasing fragrances that boost your vitality, enhances your mental clarity. 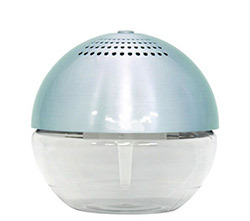 Now you can have that with uGlobal Air Purifier and our Lemon Grass essence.Keeping your air pure with our natural botanical extracts that kill bacteria and viruses and all impurites trapped in the machine water tank. 3 color changing LED lights.